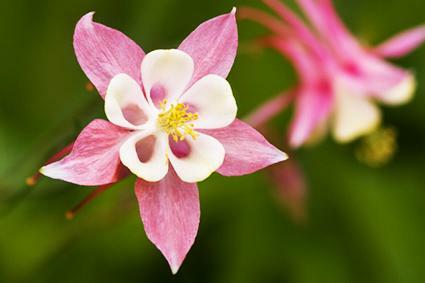 Columbine (Aquilegia) is a dainty perennial plant with exquisitely beautiful flowers and decorative foliage. In nature they are found in moist woodlands and meadows, and are available in a wide variety of colors in local nurseries. With its bell-shaped flowers in spring and early summer and soft, finely cut leaves resembling maidenhair fern, columbine is a show stopper. It's a delicate and diminutive plant, however, so it should be grown where it can be viewed from close range to fully enjoy it. The wild species rarely grow more than a foot tall with flowers about one inch in size, but there are hybrids with much larger flowers on stalks that reach over two feet in height. 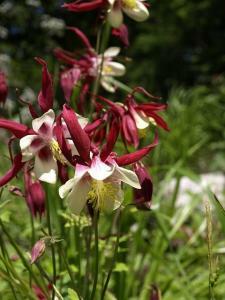 Columbine tolerates full sun in cool climates, but needs shade in hot climates. Planting it where it will receive morning sun and afternoon shade is generally a good strategy, or under large deciduous trees where it will receive filtered light throughout the day. It prefers cool conditions and rich, moist soil. In hot climates, it tends to look shabby in late summer and can be cut back to the ground and allowed to go dormant. Regular irrigation is important, as is good drainage. Columbine is most effective in small scale landscape settings where it can be viewed from close up. It is often used with other petit plants in rock gardens or in potted arrangements. The larger hybrid varieties work well in perennial borders with other plants that like partial shade, such as anemone and heliotrope. The native species often seed themselves, making them useful in informal wildflower plantings or cottage garden settings. The hybrids sometimes seed themselves, too, but they do not grow true from seed, reverting to the form of one of their parents. Columbine is typically planted from nursery grown plants in fall or early spring. The soil should be loose and enriched with compost prior to planting. They generally flower the first year and will continue to come back for several years before petering out. By this time, they are likely to have spread themselves by seed to establish a small patch, but only under optimal conditions. Remove individual flower stalks as the blossoms fade to encourage repeat flowering. In late fall, the foliage can be cut completely to the ground, as the plant will overwinter in its roots and grow new leaves the following spring. Weekly watering is essential in dry weather and it's important to maintain a layer of mulch to cool the roots, conserve soil moisture, and enrich the soil with organic matter. Monthly applications of a very diluted all-purpose fertilizer are optional, but will encourage maximum flower production. Powdery mildew, which shows up as a greyish cast on the leaves, is common on columbine and is best controlled by providing good drainage and ample air flow around the plants. 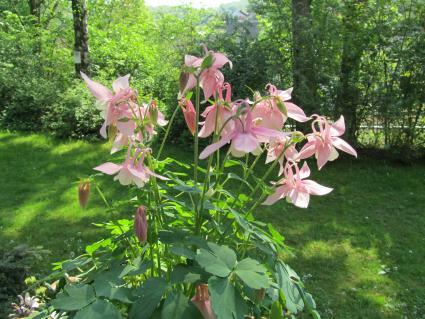 In cool, moist climates it's best to plant columbine in the sun to discourage this disease. Leafminers, insects which make tiny trail-like patterns in the leaves, also occur on columbine, but do not usually cause significant damage. If a plant becomes completely infested with either powdery mildew or leafminers, it's best to cut the leaf stalks to the ground and let it regrow anew from the roots. 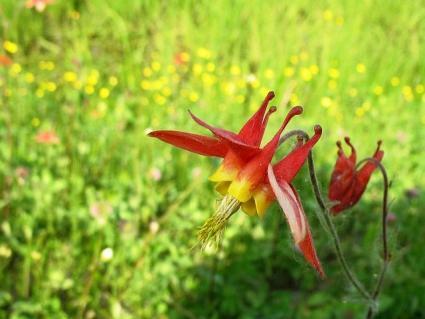 Columbines are available in almost every color of the rainbow, including many two-tone varieties. Adelaide Addison has flowers with a white and blue pattern. Snow Queen has pure white flowers. Crimson Star has deep red flowers tinged with a creamy white. Hensol Harebell has pure blue flowers and purplish foliage. Columbine is a great perennial flower for border plantings that do not receive enough sun to grow the much more abundant numbers of perennials that require full sun. It is a classic woodland plant with a refined appearance that is easy to grow anywhere that summers are not extremely hot.